The images of this artwork are for illustration purposes only. Yours will be as described below. 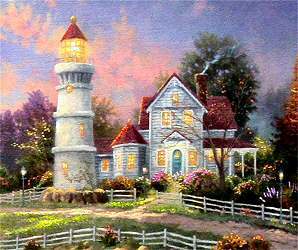 Victorian Light is the seventh lighthouse painting in Thomas Kinkade's very popular Seaside Memories series. Victorian Light is Thomas Kinkade's first lighthouse painting to feature a Victorian home instead of a cottage that usually accompany his lighthouses. Victorian Light features 5 hidden N's in tribute to his wife, Nanette. Gallery Proof Edition (G/P) Gallery Proofs are issued in quantities significantly smaller than S/N. There's something about our captivating California coast that intrigues and delights me. Whenever I set up my easel along the shore, my imagination takes flight. 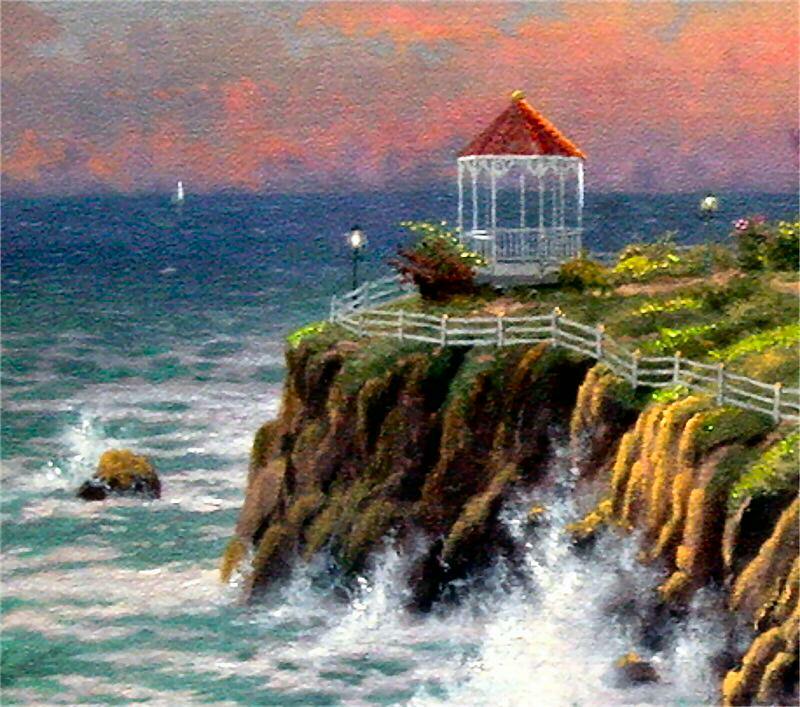 When I began to paint this imposing lighthouse, I was lost in reverie. What would it be like, I wondered, if the keeper's house were more than the humble cottage that met my eyes? What if, instead, it matched the tower in grandeur and dignity? 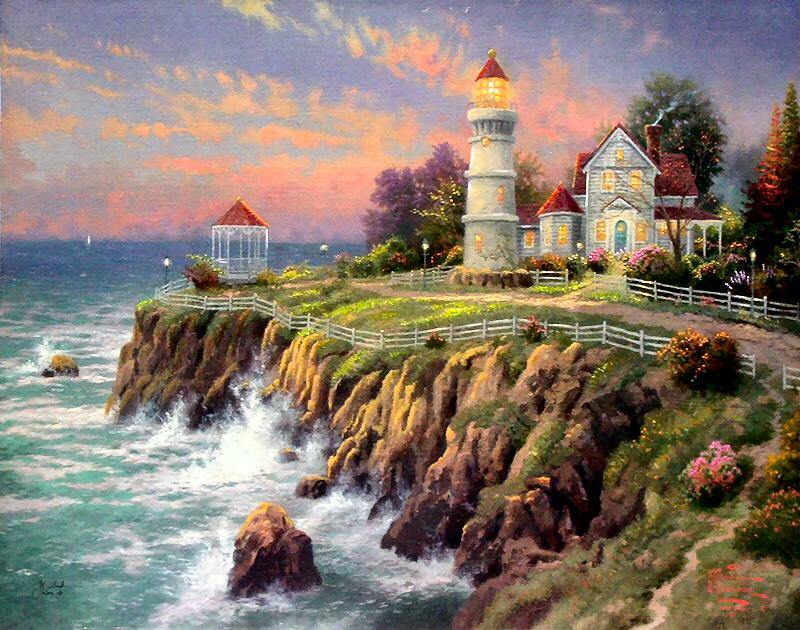 I began to paint the answer to my questions, creating a scene that merges two of my great passions - elegant Victorian mansions and stalwart lighthouses. Here, in Victorian Light, is the wonderfully civilized formal grace of a great mansion married to the primal strength of a light tower. Lighthouse keepers are notoriously lonely; their devotion to their duty is like a religious calling that cuts them off from communion with their fellow men. That's always bothered me a little; to me the lighthouse is a symbol of hope that should comfort us all. That's why I've given this lighthouse keeper a home I would love to visit. The graceful filigreed cupolas, the white picket fence, the charming gazebo extending out over the water, the warm glow at twilight - it all says to me: "Welcome. This beacon of faith is yours to share." ~~~Althought Thom mentions the California Coast in his write up about this painting, the lighthouse this most resembles is Annisquam Light of Gloucester, Massachusetts. Remember the fabulous movie "The Perfect Storm?" ~~~This Lighthouse was erected to to help mariners from running aground by the US Government. ~~~The present 41-foot Federal-style brick tower was built in 1897. In 1922 the kerosene-fueled light and fifth order Fresnel lens were removed and replaced by an electrified fourth order lens. The new light increased Annisquam Light's brightness from 1,300 candlepower to 250,000 candlepower. ~~~The lighthouse was automated in 1974. A controversy erupted that year when the Coast Guard removed the fog signal. Local boaters and fishermen complained, and one collected thousands of signatures on a petition to save the fog signal. Some said the Coast Guard was silencing the signal to appease tourists. "To hell with the tourists," said one fisherman, "They don't go fishing. We need that horn when we're coming in, especially when our radar breaks down."